I recently read the book called: The Zero-Waste Lifestyle: Live Well by Throwing Away Less* by Amy Korst. It was written by a woman who decided to go waste free for a year and it has information on why you should want to go waste free, tips on how to reduce your waste, and information on how you can make help make an impact on a global level by getting lobbying for corporate changes with respect to waste. The book introduced me to a couple of concepts I hadn't heard before: precycling and downcycling. 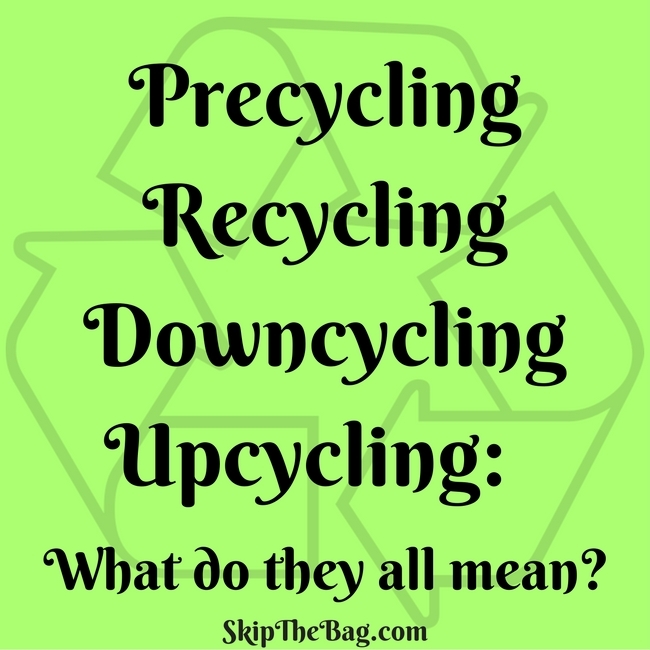 So I wanted to discuss what those are and see how they relate to two other concepts I am familiar with: recycling and upcycling. Korst defines precycling is the act of considering a product's worth, usefulness and recyclabilty before it is ever purchased. However she expands the definition further than I would. Her definition includes determining if a purchase is a need or a want, and limiting purchases that are wants. I would argue that determining if a given item is a need or a want would actually fall under the Zero Waste Tenet of Refuse, and that precycling is limited to weighing purchases based on their end life. For example I have been making apple pie refrigerator oats for my breakfasts lately. It uses applesauce and my preference to purchase applesauce in glass containers over plastic is an example of precycling. Whereas purchasing whole apples and making the applesauce myself would be an example of refusing waste. Recycing, as adapted from Wikipedia, is the process of converting waste materials into reusable objects to prevent waste and reduce consumption of fresh materials. I like this definition because it addresses the two reasons why we recycle. First, we recycle as a way to dispose of products we no longer have a use for. Junk mail, empty milk jugs, and cardboard boxes can all be recycled rather than sent to a landfill. Now the particular items which can be recycled varies widely by location, but in general every item sent to recycling is another item not sent to a landfill. Second, this definition encompasses a reduced need for new raw materials when items are recycled. Paper and glass sent for recycling means that much fewer paper or glass needs to be created. It can save energy and natural resources, but recycling itself is not without energy expenditure and pollution. Therefore it should be seen more as a last resort and not a cure for consumption. Downcycling is another concept introduced to me by Korst. She says some objects can be recycled over and over again into the same product without any loss of integrity. However, other objects cannot be made into the same product or can only be made into the same product a limited number of times. When the object cannot be remade into the same product, it is said to be downcycled. Glass and metal are products that can be recycled a near infinite amount of times. But paper and plastic are eventually downcycled. Paper is is made of fibers, as it is recycled, the fibers get shortened meaning that it can only be turned into thinner and thinner pieces of paper (think printer paper to tissue paper). Eventually it cannot be recycled anymore. Similarly plastic can usually only be downcycled. An example Korst gives is that the yogurt container is turned into plastic lumber. However she goes on to say, "Humanity can use only so many plastic benches." Upcycling is generally a fancier way of saying reusing or repurposing. It gives an item that would normally be destined for the trash, or even the recycling bin, another chance to be useful. Some examples of upcycling are turning picture frames into serving trays, taking metal washers and turning them into necklaces, turning an old door into a headboard, collecting bits of plastic trash and turn them into beautiful sculptures or even embellishing some old clothing to make them attractive and wearable. All four of these have their part in reducing waste. Precycling when examining what objects you are going to bring into your house. Upcycling to see if you can eek out some more usefulness out of the object. And lastly recycling and downcycling to preserve resources. Which of these do you do? *This is an affiliate link, read my Disclosures and Privacy Statement. Thanks for sharing! And you are welcome to join Waste Less Wednesdays here on Wednesday! I love some of your upcycling ideas like making jewelry out of old washer and such. If people would start following these rules or examples we can make a major difference in landfills. Sharing! Thank you so much! I'm always impressed with what other people are able to make from "trash". I do a lot of upcycling but lately I feel that there's too much of that and it creates even more waste. So the precycyling is the best! Yes, some people use upcycling and recycling as permission to have waste. That's why I like precycling too. Thanks for stopping by and commenting. Love your ideas! Thanks for the synopsis of the book. If I bring any plastic grocery bags into my house, I try to reuse them at least 1-2 times before recycling them. In my area (Portland, Oregon) many grocery stores have bins for recycling plastic bags. Any paper grocery bags, or gift bags, get donated to our local library's used book store where my husband volunteers. They are always in need of bags for purchases. I also reuse any gift bags I receive. If the gift bag is plain, I sometimes paint a design, or flowers, or the person's name on the front of the bag. I use lightweight cardboard (cereal boxes) to make tags for gifts and labeling storage containers, etc. You can cover the tags with cheap acrylic paint and have some great looking tags. You can give a gift in a stunning painted gift bag with matching tag, all with reused materials that cost you nothing. My favorite precycle tip: If I have to buy wrapping paper, I only buy red paper (solid red, red & white dots, stripes, etc). Red wrapping paper can be used for adults and kids of both sexes; can be used for Christmas and birthdays (the two big gift giving days), and most other times too. When my daughter was young I had wrapping paper for girl kid birthday, boy kid birthday, adult birthday, kid Christmas, adult Christmas, weddings, baby showers, generic wrapping paper, etc. Now I just buy red papers and ribbons, and I usually buy those at the Christmas sales. The only occasions that I "splurge" on are weddings and babies; but they are special and deserve a bit of cute paper. Keep up inspiring the interesting conversations. What a good idea about using lightweight cardboard as gift tags! I'll have to try that. And I LOVE the red wrapping papper idea. Thank you! These are all great ideas. I admit, this is something we definitely need to work on. Shared and pinned - spread the word! I try to recycle, repurpose and upcycle all the time. I did not know that repurposing and upcycling can be the same. I thought upcycle is sort of a makeover whereas repurpose is a makeover with a new use. Thanks for clarifying. Webster and his dictionary may disagree with me, but in my book they are close enough to be used interchangably. :) Thanks for the comment! Ever since I came to know about a recycle centre near me, it has made it easier for me to dispose my recyclable waste easily. I also spread awareness about recycling in my neighbourhood. 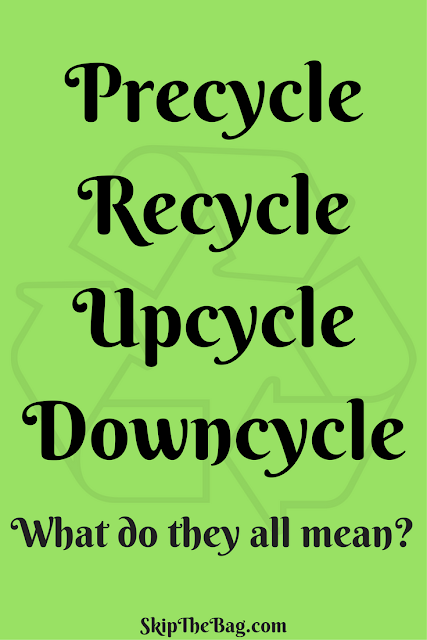 Nice definition about Precycling, Recycling, Downcycling, and Upcycling. Thanks for sharing this information. I agree that precycling and refusing are the ways to make the largest impact. Thanks for helping spread the word!